Wildfires turn millions of hectares of vegetation into charcoal each year but it wouldn't seem like it ends up in the oceans. Yet researchers have found that this charcoal does not remain in the soil, as previously thought. Instead, it is transported to the sea by rivers and thus enters the carbon cycle. The researchers analyzed water samples from all over the world. They demonstrated that soluble charcoal accounts for ten percent of the total amount of dissolved organic carbon. Researchers collected 174 water samples from all over the world, including rivers like the Amazon, the Congo, the Yangtze as well as Arctic sites. Surprisingly, in any river across the world about ten percent of organic carbon that is dissolved in the water came from charcoal. With this robust relationship in hand they estimated the global flux of dissolved charcoal, based on previous scientific studies that focused on organic carbon flux. According to these estimates, about 25 million tons of dissolved charcoal is transported from land to the sea each year. "Most scientists thought charcoal was resistant. They thought, once it is incorporated into the soils, it would stay there," says Rudolf Jaffé from Florida International University's Southeast Environmental Research Center in Miami. "But if that were the case, the soils would be black. Most of the charcoal in nature is from wild fires and combustion of biomass in general. When charcoal forms it is typically deposited in the soil." From a chemical perspective, no one really thought it dissolves, but it does. It doesn't accumulate like we had for a long time believed. Rather, it is transported into wetlands and rivers, eventually making its way to the oceans." Thorsten Dittmar from the Max Planck Institute for Marine Microbiology in Bremen focuses on carbon chemistry in the oceans. "To understand the oceans we have to understand also the processes on the land, from where the organic load enters the seas," Dittmar says. The new findings are important to better calculate the global carbon budget. This budget is a balancing act between sources that produce carbon and sinks that remove it. Detailed calculations are important to assess climatic effects and find ways to alleviate them. 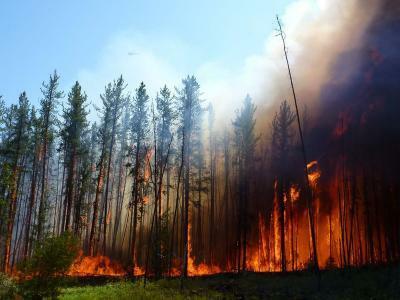 Until now, researchers could only provide rough estimates of the amount of charcoal in the soil, and most of these estimates turned out to be wrong, as the total amout is determined by charcoal producing processes, like wild fires, and transport to the oceans. According to the authors, the results imply that greater consideration must be given to carbon sequestration techniques (the process of capture and long-term storage of atmospheric carbon dioxide). Biochar addition to soils is one such technique. Biochar technology is based on vegetation-derived charcoal that is added to agricultural soils as a means to store carbon. Although promising in storing carbon, Jaffé points out that as more people implement biochar technology, they must take into consideration the potential dissolution of the charcoal to ensure these techniques are actually environmentally friendly. Jaffé and Dittmar agree that there are still many unknowns when it comes to the environmental fate of charcoal, and both plan to move on to the next phase of the research. They have proven where the charcoal goes. Next, they want to answer how this happens and what the environmental consequences are. The better scientists can understand the processes and the environmental factors controlling it, the better the chance of developing strategies for carbon sequestration and help mitigate climate change.